Stacy Dockery was attending the Route 91 festival in Las Vegas when gunfire began to rain down upon her. Her instincts kicked in immediately: she shielded her best friend, then went to work assisting victims on the ground. Stacy assisted other off-duty medical personnel with bleeding control, triage, and loading patients into whatever vehicles they could find. As the incident continued to unfold, she knew that this was an extreme situation, and that she would be needed throughout the night. Stacy placed her friend in safety, then sped towards the station. She donned her uniform, complete with cowboy boots, jumped on a unit, and went to work running 911 calls. She responded to calls into the night until the situation had calmed some. She was later featured in a New York Times video when a reporter captured her caring for a patient in the concert venue. 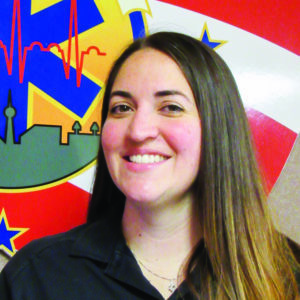 In Stacy’s nearly ten years with MedicWest, she has proven herself to be a dedicated CCT medic who can be relied upon to answer the call of duty. See Stacy from behind at the 0:36–0:38 mark of this New York Times video.